Is it point-of-upload censorship, or fair remuneration for creatives? Either way, by passing Article 13/17, the European Parliament flexed its muscles ahead of the May elections. Somewhat incongruously, a meeting of the European Union’s agriculture ministers on 15 April will probably see the finalization of the first major update to the bloc’s copyright laws since the turn of the millennium. The EU’s new Copyright Directive has been the subject of major battles through the legislative process; the war’s end will be agreed between discussions of farmers’ funding and climate change. If, as expected, the European Council rubber-stamps the Directive, online content-sharing services operating in the EU will need to prepare for major changes to the way they operate. This is due to Article 17 of the Directive, which was until recently known as Article 13—the focus of many a digital rights campaigner’s ire. The 2000 E-Commerce Directive has long given content-sharing services safe harbor from liability over copyright infringements that take on their platforms, as long as they remove copyright-violating content that is flagged up to them. However, the new Copyright Directive declares that they are performing an act of communication to the public when they provide access to copyrighted works, so they need to get rightsholders’ authorization or face being liable for violations. What would these best efforts to ensure unavailability entail? Although the Directive claims that it “shall not lead to any general monitoring obligation,” the outcome will in many cases involve automated filters that scan everything people upload in an attempt to compare the uploads with known copyrighted works. It was once the case that the draft law explicitly referred to “the use of effective content recognition technologies” as a way to keep copyright-violating uploads off platforms, but that led to the European Parliament’s rejection of the draft in July 2018. The language morphed into the vague “best efforts to ensure unavailability” terminology and Parliament’s rapporteur on the file, Axel Voss, insisted that filters were no longer foreseen. However, the effect remained the same, as EU Commissioner Günther Oettinger, who proposed the legislation in 2016, has repeatedly admitted since the European Parliament finally green-lit the text on March 26. Indeed, the day after the vote, French culture minister Franck Riester also gave a speech announcing an immediate push for content recognition technologies in that country’s transposition of the Directive. But in the end, the European Parliament cleared the text by 348 votes to 274. This was largely thanks to more than two-thirds of the European People’s Party (EPP)—the biggest voting group—backing the text, with support from the majority of MEPs in the liberal ALDE group. The Socialist and Democrats (S&D) were split on the Directive, and the left-wing Greens/EFA and GUE/NGL groups were heavily against it. In terms of country breakdown, by far the heaviest support for the Directive came from France—a mere two French MEPs voted against it. Denmark, Finland, Belgium, Latvia, Portugal, and Slovakia were also keen supporters. The heaviest opposition came from German, Estonian, Czech, Dutch, Polish, Luxembourg, Slovakian and Swedish MEPs. British lawmakers were quite evenly split on the issue. Crucially, the European Parliament passed the Directive after accidentally voting not to consider alterations to the text, which would have potentially allowed the removal of both Article 17 and the also-controversial Article 15 (previously known as Article 11). Article 15 extends across the EU a new right for press publishers called ancillary copyright, basically the right to demand licensing fees when services such a Google News reproduce parts of their articles. It has previously failed to function as planned in Germany and Spain. Parliament rejected the possibility of changes by five votes—it turned out 10 MEPs had meant to allow changes but pressed the wrong button. No matter; while the final record of a a European Parliament vote can be changed for posterity, the result will not change. Might the vote have some effect on MEPs’ chances for re-election in May? 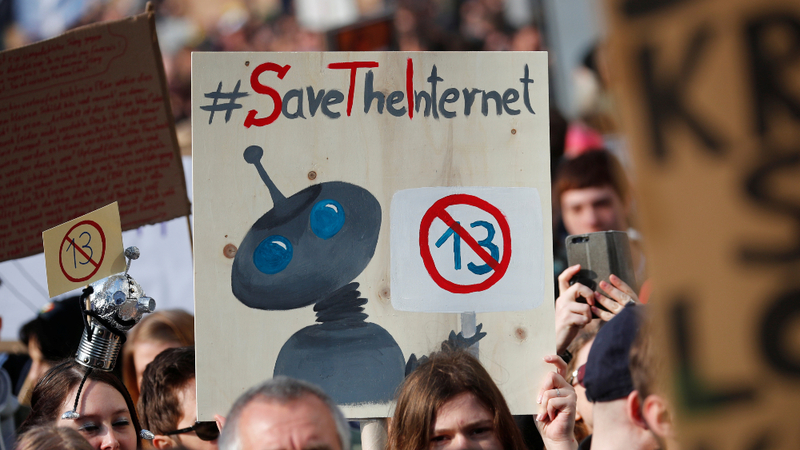 Given the fact that Article 13/17 sparked significant street protests and Wikipedia blackouts in countries such as Germany and Czechia, and over five million signed a petition against it, there may be fallout. Digital rights campaigners have already set up set up online services to help people see how their MEP voted. And so the Directive goes to that mid-April agriculture council meeting. But is there any chance of it falling at the last minute? This would require a blocking minority of countries representing at least 35% of the EU, and it seems unlikely that such a coalition can be achieved. There could be opposition from some countries where the local EPP parties came out against Article 13/17, such as Sweden and Czechia, but unless Germany follows suit, a blocking minority is out of the question. German justice minister Katarina Barley has decried the use of upload filters. However, according to Germany’s Frankfurter Allgmeine Zeitung newspaper, Berlin and Paris did a deal whereby the former would support the Copyright Directive if the latter would support the construction of the German-backed Nord Stream 2 gas pipeline from Russia. And don’t forget that the version of the text approved by the European Parliament, with no alterations, was what came out of Council in the first place.